If you have had an accident it is often difficult to decide who is the best choice of solicitor or other organisation to deal with your accident claim. 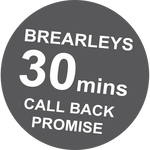 The fact is that Brearleys Solicitors have been dealing with personal injury claims for many years and are the local recognised specialists in dealing with such claims. We take pride in the fact that we are qualified solicitors dealing with all types of personal injury in a specialist way. We are able to ensure that you get the best possible service ,the highest possible chance of success and the highest possible compensation. You will meet your solicitor who will deal with the case from start to finish. In many cases the service that we provide will be absolutely free. Where this is not the case we will clearly set out what you will be charged if anything and why . We are members of the personal injury panel, the Association of personal injury lawyers, and are committed to providing an excellent service to all of our clients .